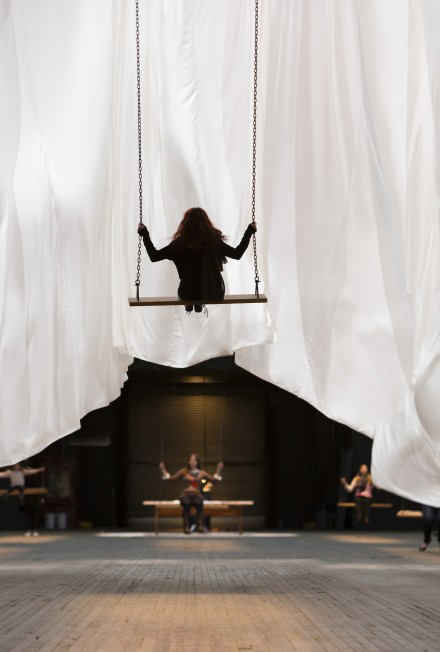 American artist Ann Hamilton is widely recognized for her large-scale immersive multimedia installations, touching upon themes of collective consciousness, space and labor. 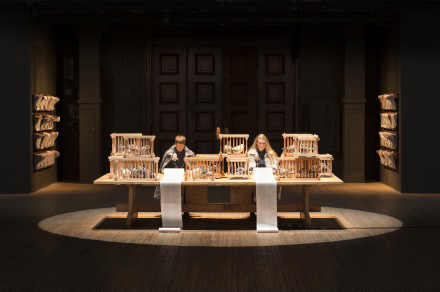 Her current installation, “the event of a thread” commissioned by and on view at The Park Avenue Armory in New York, does not fall short. 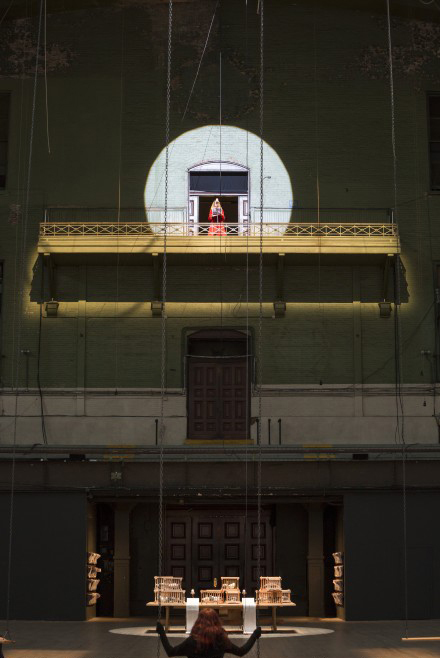 “Ann Hamilton’s installation will tie together the Armory’s architectural presence and its social history to create a visceral and resonant experience for our visitors,” stated Rebecca Robertson, President and Executive Producer of Park Avenue Armory. Alongside the conceptual components of the exhibition it is also a peaceful, fun and enjoyable experience. Standing on the balcony looking down into the 55,000 square foot Wade Thompson Drill Hall, which resembles a 19th century European train station, it feels like looking into a surrealist landscape. Somehow time stands still in the hall, full of activity and people. Suspended via ropes and pulleys, a white cloth measuring more than two times the width of the hall is suspended. 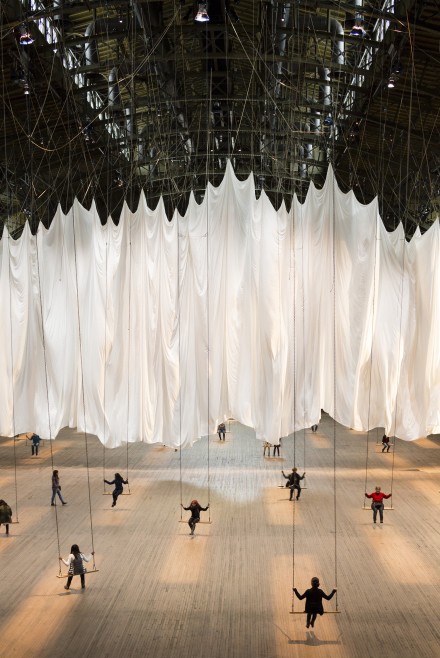 Swings are hung low on either side of the cloth throughout the hall; the movement of the visitors swinging causes the cloth to billow. 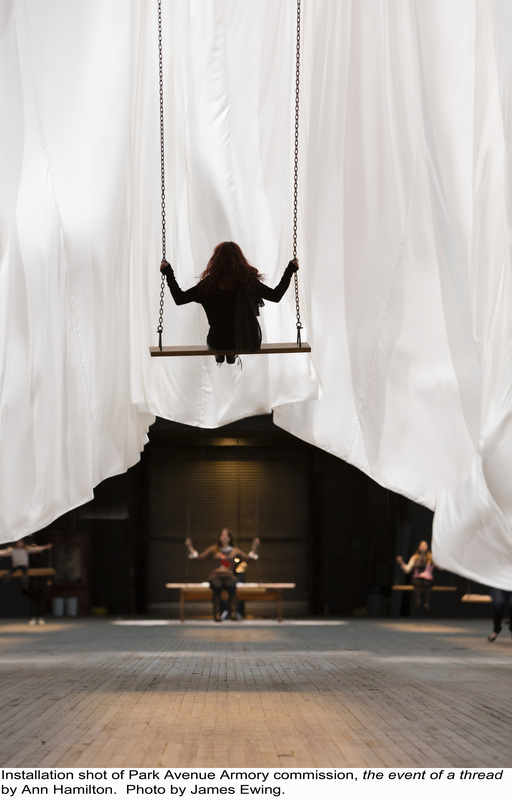 “the event of a thread” is Hamilton’s first large-scale production in New York for more than 10 years, not taking into account her piece human carriage, which was commissioned and exhibited at The Guggenheim Museum in 2009. Although large scale exhibitions based on visitor participation that are immersive, highly sensory but also fun have been popular in New York in the past year, Hamilton’s piece is unique in that she has actively incorporated the social history of the space as a core of the exhibition. (Carsten Höller’s “Experience” at The New Museum and Tom Sachs’s “Space Program: Mars” have also been installed at The Park Avenue Armory). In the entrance, two readers sit facing the hall at a table with birdcages housing pigeons. They are dressed in gray and reading into microphones from long scrolls. The Park Avenue Armory, also known as the Seventh Regiment Armory, served as headquarters and administrative building for an infantry regiment of the Union Army during the Civil War. The regiment was equivocally known as the Silk Stocking Regiment, due to the fact that many of its members were from the social elite. The readers read a concordance, which Hamilton defines in her artist statement as “A concordance is also an agreement, a harmony.” The reading is executed with great discipline and in a highly formalized fashion, military style. Their voices are broadcast through microphones in paper bags placed around the hall. The caged pigeons are let out for flight through the hall as a spectacle at the end of each day, as an end to their enslavement. Other spectacles also take place during the course of the exhibition; during my visit on its opening night, an opera singer sung as visitors were ushered out of the hall during close. The hall becomes a safe haven for its visitors where they can play, observe and relax. People lie alone or in groups under the billowing sheet, like as if they were relaxing in a park on a hot summer’s day, sometimes chatting softly with a neighbor. People push each other on the swings. The exhibition revolves around peaceful meetings; objects, people, words and animals. With the backdrop of the building’s history, built during the civil war, the exhibition speaks perhaps of the time of peace after war or perhaps it is telling an alternate history on how concordance results in peace. 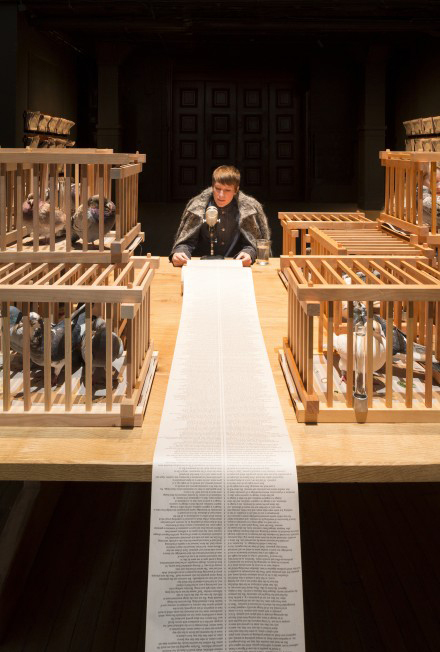 “the event of a thread” at The Park Avenue Armory in New York closes on January 6th, 2013. This entry was posted on Thursday, January 3rd, 2013 at 12:28 pm	and is filed under Art News, Go See. You can follow any responses to this entry through the RSS 2.0 feed. You can leave a response, or trackback from your own site.